William Henry Younkins Sr. was born under the surname "Younkin" on June 5, 1847. in Upper Turkeyfoot Township, Somerset County, the son of Charles L. and Nancy (Henry) Younken. He was one of five brothers and brothers-in-law to serve in the Union Army during the Civil War. At age 14, William resided at home near Ryerson Station, Richhill Township, Greene County, but did not attend school and was not yet a farm laborer as was an older brother. During the Civil War, circa late 1863, William enlisted in the 4th West Virginia Cavalry, Company C. The term was to have been six months of duty. Also serving in this regiment was William's distant cousin by marriage, LeRoy Forquer, of Ursina, Somerset County, PA, of the family of Christina (Younkin) Dull. He apparently was discharged in early 1864. At the age of 17, on Aug. 2, 1864, with the war still in action, William joined the 14th Pennsylvania Cavalry (159th Volunteers). He was assigned to Company E, with his name occasionally misspelled "Younkers" or as "William C. Younkin." He rose to the rank of corporal. ...in a tent very sick. Had him carried from there to the Field Hospital and did not think he could live any length of time. Had no way of knowing what his disease was. One of the boys who were carrying him, made the remark that we might as well bury him here, and save the trouble of carrying him so far to the Hospital, for he would be dead in a day or two anyway. He mounted a remarkable recovery and was honorably discharged after the war's end, at Alexandria, VA on May 30, 1865. On Dec. 3, 1866, at West Alexander, Washington County, PA, the 19-year-old William married 31-year-old Elizabeth J. (Starkey) Piatt (or "Pyatt") (1835- ? ), widow of Civil War soldier Robert Piatt. He was 12 years younger than his bride. Elizabeth's first husband, a casualty of the war, had died in a hospital in Chattanooga, TN, allegedly as the result of wounds. She thus brought three children to the marriage with our William -- Martha Piatt, Alice Piatt and James Piatt. William and Elizabeth went on to have these children of their own: Robert C. Younkins, William Henry Younkens Jr., Mary M. "Mollie" Lewellen, Charles A. Younkens and George W. Younkens. Circa 1870, they resided in Wheeling, Ohio County, WV where William worked as a general laborer. By 1880, they were in Fairchance, Georges Township, Fayette County, PA, with William employed as an "engineer." During their years in Fairchance, they were neighbors and friends with A.L. Osborn (his former sergeant), Alexander J. Swaney and James K. Hugh. His longtime friend Hugh once wrote that he had "worked with him more or lefs all the time I have known him, worked with him on brick yard at Wheeling W.Va. and on Farms at Fairchance Pa., also in Rolling Mill at Fairchance." Elizabeth submitted an application for a widow's pension on Jan. 30, 1890, using her husband's name as "William C. Younkins." [App. #413.739, Cert. #406.263]. It was approved, and she began receiving payments. She submitted a second widow's pension application on May 21, 1912, under the name "William H. Younkins," and it too was approved. [App. #987.254 - Cert. #747.230] How she managed to "double-dip" the Department of the Interior's Bureau of Pensions, while her husband was still alive, is not yet known. Circa 1918, at the age of 71, William was indigent and lived at the Greene County Home for the Poor. (There, he went by the name "Henry" and was considered single.) Suffering from kidney disorder ("chronic interstitial nephritis"), he died at the home on Dec. 29, 1918, after enduring the ailment for a year. Burial was in the Home cemetery. His brother Jefferson Younken furnished the details for his official Pennsylvania certificate of death, with both spellings used. Five years later, in 1923, William's cousin Elias Minor also died at the home and also was buried in the home cemetery. He is listed by name in the 1915 book, The Fourteenth Pennsylvania Volunteer Cavalry in the Civil War, authored by Rev. William Davis Slease. Elizabeth's fate is not known but is being researched. Step-daughter Martha Piatt (1854- ? ) was born in about 1854. She was raised by her mother and step-father and took the surname "Younkins." In 1870, at age 16, she was a seamstress and lived with her parents' roof in Wheeling, Ohio County, WV. Step-daughter Cecilia Piatt (1856- ? ) was born in 1856. She was raised with her step-father's surname of "Younkins" and as a teenager in 1870 resided with her family in Wheeling, Ohio County, WV. Step-daughter Alice Piatt (1860- ? ) was born in 1860 in West Virginia. She was raised under the surname "Younkins" or "Younkens." Son William Henry Younkins Jr. (1867-1943) was born on May 8, 1867 (or 1865) in Wheeling, Ohio County, WV. He was a laborer. On Oct. 16, 1887, he married Ella Hughes (1867-1938), daughter of Civil War veteran Isaac and Sarah Elizabeth (Artis) Hugh (or "Hughes") of Fairchance. They had one daughter, Frances Graham, and made their home in Fairchance. He is believed to have been a road contractor and to have received a contract in the summer of 1912 for grading a new railroad line along the Cheat River in Fayette County, operating under the name Younkin & Wilson of Fairchance. Circa 1912, William is thought to have been active with the Independent Order of Odd Fellows (IOOF) in Fayette County and made visits to lodges in Uniontown, Smithfield, Brownfield, Point Marion and Fairchance. He also was a candidate for Fairchance Borough Council in about 1898. Later in life, by 1927, they relocated to Fairmont, Marion County, WV. Sadly, Ella was stricken with cancer of the uterus and cervix with frequent bleeding due to anemia. She died in Fairmont on Dec. 7, 1938 at the age of 77. An obituary in the Uniontown Morning Herald noted that she was survived by four granddaughters in addition to her brothers John Hugh and Charles Hugh and sisters Ida Keefer and Jennie Lilley. William survived his wife by five years. Suffering from the after-effects of a heart attack and hardening of the arteries, he was admitted to the Marion County Home in Fairmont, WV. He died in the Home at the age of 77 on Jan. 15, 1943. His remains were returned to Fairchance for interment beside his wife. Daughter Frances Younkins (1891 - ? ) was born in about 1891 in Fairchance. At the age of 23, on Dec. 2, 1914, she wed 24-year-old insurance man Ohley F. Graham (1890- ? ). He was the son of Sherman and Mattie (Hartley) Graham of Morgantown, Monongalia County, WV. The ceremony was held at Fairchance, performed by Rev. C.H. Miller. In the marriage license application, the couple asked that the news not be published. In 1938, their home was at 701 Benoni Avenue in Fairmont. Son Robert C. Younkins (1869- ? ) was born in late 1869 in Wheeling. Daughter Mary M. "Mollie" Younkins (1872-1907) was born on Aug. 29, 1872 in Fayette County. On the Fourth of July 1893, when she was age 20, she married 23-year-old coal miner Benjamin B. Lewellen (Jan. 12, 1870-1929), son of William G. and Martha (Bell) Lewellen. The nuptials were celebrated in Fairchance by Rev. P.F. Conaway. Because she legally was underage, Mollie's father signed his consent to the union. The couple lived in Fairchance and had one known son, Charles W. Lewellen. Heartache shook the Lewellens in April 1894 when their baby son Charles died at the tender age of 10 days. Tragedy further severed the family in the winter of 1907 when Mollie contracted pulmonary tuberculosis. Unable to regain her health, she died at the age of 34 on Feb. 3, 1907. Her husband signed her death certificate. Burial was in Fairchance. Benjamin married a second time to Kadie ("Katie?") ( ? - ? ). They resided in Fairchance, where he was employed as a clerk at the Union Supply Company. On Dec. 19, 1929, just a few weeks before his 60th birthday, Benjamin suffered a stroke, fell and hit his head, causing a contusion to the brain and laceration of the scalp. He lingered for three days and succumbed on Dec. 22, 1929. His remains were placed into repose in Fairchance Cemetery. Son Charles A. Younkins (1875-1898) was born on May 16, 1875. He died on April 25, 1898, at the age of 23, with burial in the Fairchance Cemetery. The cause of his untimely death has been shrouded by time. Son George W. Younkins (1880- ? ) was born on March 29, 1880 (or 1878). He worked in early adulthood as a coal miner. At the age of 19, on Christmas Day 1899, he wed 19-year-old Fairchance resident Catherine "Katie" Hughes (1880- ? ), daughter of Daniel and Mary Hughes. Rev. J.W. Howard officiated. Their known children were Clara M. Bobo, Edgar H. Younkins, Nellie B. Miller, Charles R. Younkins, Wilda E. Ridle, Harry Earl Younkins, Homer Floyd Younkins, Mary Katherine Everly, Geraldine Tulbure, George W. Younkins Jr., Robert E. Younkins, Thomas Wayne Younkins and Walter V. Younkins. When the federal census was enumerated in 1900, the newlyweds made their home in Fairchance, and George earned a living as a coke drawer. By 1910, still living in Fairchance, George was employed as a laborer in a glass house. He returned to coal mining and worked in that occupation in the Fairchance area as shown on the 1920 census. After about a quarter century of married life, work and family-raising in Fairchance, the Younkins relocated in the early 1920s to Ohio. The census of 1930 shows them residing there on South Fourth Street in Martins Ferry, Pease Township, Belmont County. George's occupation in 1930 was as a house painter, assisted by his son Floyd. Daughter Clara M. Younkins (1899- ? ) was born in about 1899. She was united in holy matrimony with (?) Bobo. She was deceased by 2000. Son Edgar H. Younkins (1902-1983) was born on Feb. 18, 1902 in Pennsylvania. He wedded Catherine Fronius ( ? -1976). The couple produced two known sons, Arthur Younkins and Elmer Younkins. In 1947, the family resided in Dresden, Muskingum County, OH. For more than three decades, Edgar was employed as a distributor for Standard Oil Company. The Younkins' made news in the Zanesville Times Recorder in July 1963 when they held a family picnic and surprise wedding shower for their daughter Donna and her newlywed husband Robert Woodward. The attendees included Edgar's brothers Walter, Wayne and George and their families, all from Martins Ferry, OH. Sadly, Catherine died on Oct. 21, 1976. Edgar survived his wife by seven years and relocated to Michigan. At the age of 81, on Sept. 20, 1983, Edgar died in Alpena General Hospital in Alpena, MI. His obituary was published in the Coshocton (OH) Tribune. Father John Kempf officiated at the funeral service, with interment in Memorial Park. Grandson Arthur Younkins ( ? - ? ) was born in (?). He sereved in the Army during World War II and spent four months in the European Theater. He was sent back to Fort Dix, NJ in August 1945 expecting to be ordered to report to the South Pacific region. In September 1947, he was joined in holy wedlock with Betty Steele, daughter of Harry Steele of Dresden. Rev. Daniel K. Freymeyer and Rev. Louis Bangerter jointly officiated at the ceremony held in the Dresden Methodist Church. Mrs. Bern Riley served as Betty's matron of honor, and Arthur's brother Elmer was best man. Among the ushers were Arthur's uncle, Walter Younkins of Martins Ferry, OH along with John Freymeyer and Paul Riley. Their home in 1983 was in Martins Ferry. Grandson Elmer E. Younkins grew up in Dresden, OH. He was a corporal in the U.S. Armed Forces during the Korean War. On Nov. 28, 1951, he married Barbara Jo Stuller, daughter of Kermit Stuller of Dresden. The groom and bride both belonged to the Dresden Methodist Church, with Elmer working at Dresden Paper Company and Barbara Jo at Dresden Printing. He lived in Martins Ferry, OH in 1983. Granddaughter Donna Younkins ( ? - ? ) was born in (?). On March 23, 1963, she was united in matrimony with Robert Woodward ( ? - ? ). They made their residence in Lancaster, Fairfield County, OH. Daughter Nellie B. Younkins (1904-2000- ? ) was born on July 5, 1905 in Fairchance. On June 12, 1926, she married Vernon Miller ( ? -1960). They moved in 1926 to Zanesville and produced two children, Edward Allen Miller and Lois Cavender. Sadly, their son Edward passed away in infancy. There, she was employed as a laborer with Roseville Pottery. For 74 years, she was a member of the First Free Methodist Church. Vernon died in 1960. Nellie lived for another four decades. She passed away at the age of 95 on Feb. 8, 2000 while a patient in Genesis Good Samaritan Hospital in Zanesville. Granddaughter Lois Miller married (?) Cavender. They lived in Zanesville and bore three children, Linda Cavender, Larry Cavender and David Cavender. Son Charles R. Younkins (1907- ? ) was born in about 1907 in Fairchance. He was married at least twice. The details of his first marriage are not known. In the early 1950s, he was employed as a mill worker in Martins Ferry. At the age of 47, on Oct. 29, 1953, married 37-year-old Margaret V. Potts (1916- ? ), daughter of John B. and Martha (Yoskum) Potts. The wedding was held in Jefferson County, OH. Margaret, a resident of Yorkville at the time, worked as a waitress. He was deceased by 2000. Daughter Wilda E. Younkins (1909- ? ) was born in about 1909. She wedded (?) Ridle ( ? - ? ). She was deceased by 2000. Son Harry Earl Younkins (1911-1936) was born in on Nov. 3, 1911 in Fairchance. He suffered from mental illness or disability, and in 1927 was diagnosed as an "imbecile." He was placed in the Institution for Feeble Minded in Scioto, Pickaway County, OH, He died there at the age of 24 on June 29, 1936, following a case of pulmonary tuberculosis. His remains were brought back to Martins Ferry for interment. Son Homer "Floyd" Younkins (1914-1940) was born in about 1914. Circa 1940, he dwelled in Marine City, MI where he was employed as a member of the crew of the freighter William B. Davock, operating in Lake Erie. At the age of 27, in November 1940, the Davock went missing in a heavy storm. Word was telegraphed to his sisters Nellie Miller and Mary Younkins, with a story printed in the Zanesville Times Recorder. The sisters, accompanied by their father, brother and sister, traveled to Marine City to await news. Said the Times Recorder, "Press dispatches yesterday indicated that hope had been given up that any of the crew of 33 had been saved." In fact the ship had lost its rudder and ability to navigate, and had gone down with all hands. 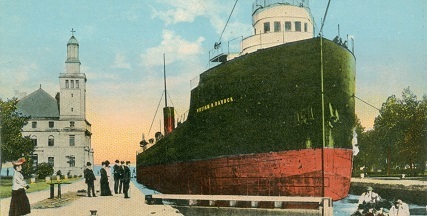 The wreck was discovered in 1972 in 200 feet of water south of Pentwater, MI. Daughter Mary Katherine Younkins (1917- ? ) was born in about 1917. Circa November 1940, she lived at 25½ North Sixth Street in Zanesville. She wedded (?) Everly ( ? - ? ). Her home in 1983 was in Zanesville. Daughter Geraldine Younkins (1918- ? ) was born in about 1918. She was joined in wedlock with (?) Tulbure. Their residence in 2000 was in Martins Ferry. Son George W. Younkins Jr. (1919- ? ) was born in about 1919. He was married and dwelled in Martins Ferry, Belmont County, OH circa 1963. Son Robert E. "Bob" Younkins (1920- ? ) was born in 1920. Son Thomas "Wayne" Younkins (1921- ? ) was born in on Jan. 28, 1921. As a young man, he worked as a printer in Martins Ferry. On July 27, 1944, in Belmont County, he married Anna V. Yeater (1926- ? ), daughter of Otis and Ledora (Bennett) Yeater of Elm Grove, WV. Rev. Howard F. Miller, of the First Christian Church of Martins Ferry, officiated. Circa 1963, the Younkinses lived in Martins Ferry and in 2000 in St. Clairsville, OH. Son Walter V. Younkins (1924- ? ) was born in about 1924 in or near Martins Ferry, Belmont County, OH. He served in the U.S. Army during World War II. At the age of 21, on June 12, 1945, he wed 21-year-old photographer Martha B. Rood (1924- ? ), daughter of Frank and Julia (Denger) Rood of Wheeling, Ohio County, WV. Officiating their nuptials was Rev. Henry Newman, a Lutheran minister from Bridgeport, OH. His home in 2000 was in Martins Ferry.